The Deinosuchus was one BIG, mean Crocodilian. But to our Deinosuchus it is home. 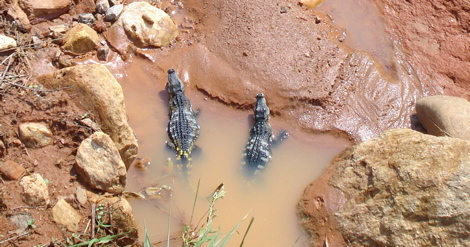 The muddy water keeps them cool and hides them from potential prey. "Hey, hey you! 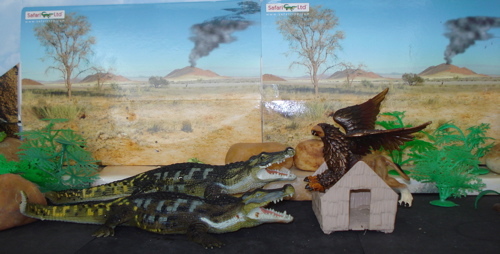 Come back here, or at least slow down...."
Introduced in 1995 by Safari Ltd as part of the Carnegie Collection (opens new window) it is still, after fifteen years, the best Deinosuchus on the market today. The original one lived in the late Cretaceous period and was forty or more feet (12 meters) long and weighed as much as eight to ten tons. This one is just over a foot (30.5cms) long and weighs nine and 3/8 ounces (9.375 oz, 267gms) so it is significantly smaller. 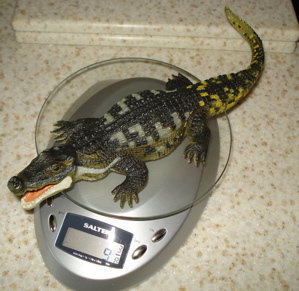 One fortieth (1.40) scale, in fact. Just like the majority of the Carnegie Dinosaurs. "Last one in's a rotten birdy egg!" I remember as a six year old walking out of the Cretaceous Period hall of the AMNH and looking down to my right and seeing what seemed like the biggest, meanest-looking skull I could have imagined. 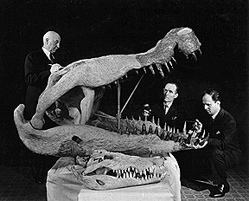 In the display case was the head (skull) of a Deinosuchus, perhaps six or more feet in length and on the plaque to the case it said that this creature grew up to fifty feet in length! 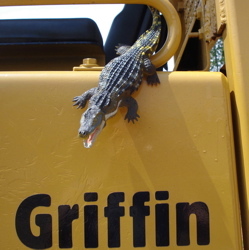 I was awestruck and developed a suddenly increased respect for modern-day Alligators and Crocodiles. The huge head of the Deinosuchus is very well done, it's multiple teeth individually sculpted and its big mouth open and ready to snap shut on an unwary tasty Tidbitosaurus or passing tourist make it quite fearsome. by what must be very myopic but highly expert toy handpainters in China. 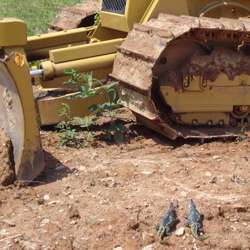 In the meantime the Deinosuchus have found what may be their new home. But first they have to do something about the current dwellers. Of course even the new residents must make certain acquiescence for some of the previous residents. "Yes, I live in an RV... so what?" "Uh... nothing, nothing at all." "This is kind of a weird neighborhood." "This IS a weird neighborhood." with a panoply of highly detailed and individually sculpted scales covering the entire back, belly and legs. Laying in wait in the shallows the Deinosuchus specializes in ambush-hunting. Although not every ambush is as successful as that one was. Being wary and having a good point of view can foil ambushes. The Deinosuchus, both the original and the Carnegie Collection variety, rely on moving or muddied water to camouflage them in plain sight. When ambush fails and hunting isn't proving profitable there is always "borrowing" from other creature's larder. "We've come to the River Bank..."
...to make a withdrawal from YOUR account." 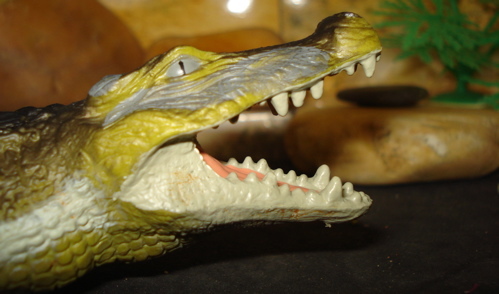 The Carnegie Collection Deinosuchus is one of the best figures from the mid-nineties. This was a period of transition for this collection as it was for other manufacturers as well. They were going from a more toy-like figure, with muddied detail, "generic" shapes and bright-happy colors to the highly detailed and more naturally colored Dinosaur toys that we see today. Looking down from a Pterosaur's point of view we see the fabulous detail of the Deinosuchus' back (below. 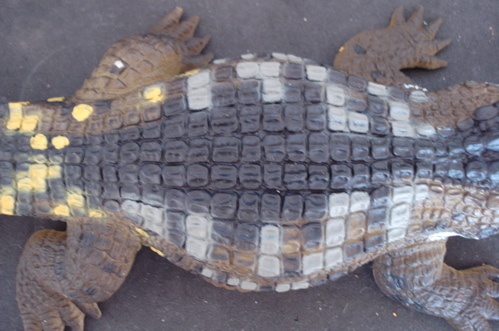 Taking a slightly longer view (below) we see that the overall shape of this figure is basically similar to the modern Alligator (scroll to bottom of long page), although much, much bigger. 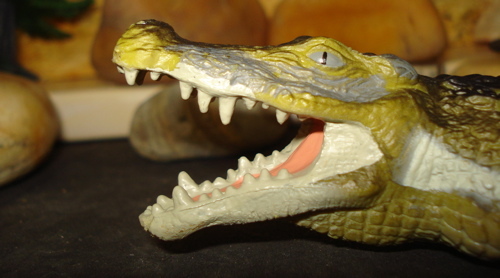 The Deinosuchus is, in fact, a relative of the Alligator if not an ancestor. Maybe these will reconsider that abrupt eviction near the top of the page. The paint-job is particularly interesting, combining black down the spine with lighter gray and olive drab on the sides and yellow and paler green on the tail. It is mindful of the digitalized "ambush-camouflage" uniforms of the military. 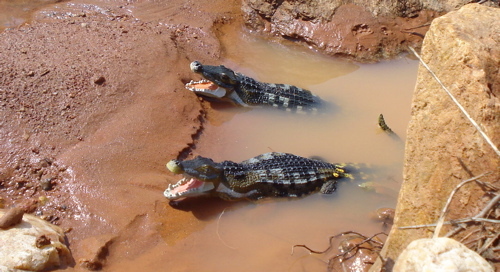 Being relatives of modern-day Crocodilians has led our trio to consider some modern-day-prey, prey that even the largest Crocodiles consider a bit much. "No need for the 'barby.' We'll eat it here." 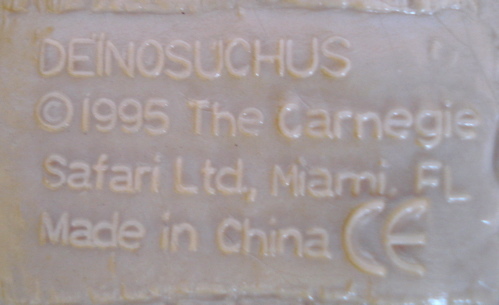 including the throat, the only exception being a 1"x1.5"square where the imprint is. The Deinosuchus was nothing if not forty feet of appetite, with attitude, and the ability to back it up. Any creature careless enough to come within "ambush range" was in what today we call deep, uh, danger. 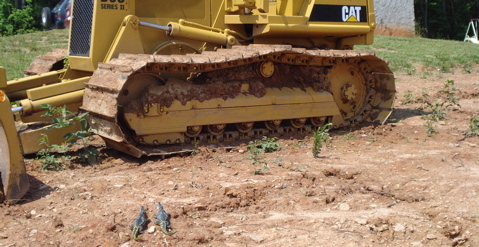 Here we see a Carnegie Maiasaura ("Good-mother lizard") coming to the river bank for a drink. "How about "Maiasaura goes well with a stream of water?'" 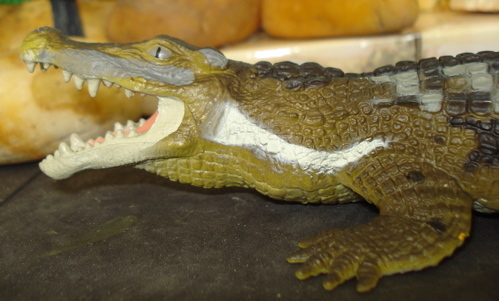 The Carnegie Deinosuchus despite coming out in 1995 it is one of the very few figures from that era that has undergone neither a re-paint nor a resculpt. 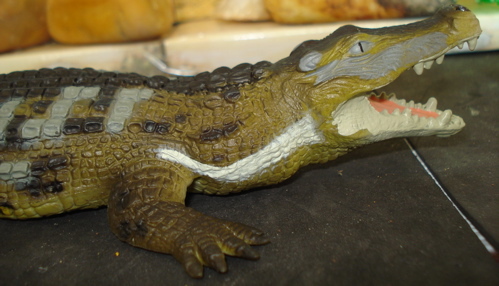 It remains not only the best Deinosuchus on the market, it is an extremely good one. 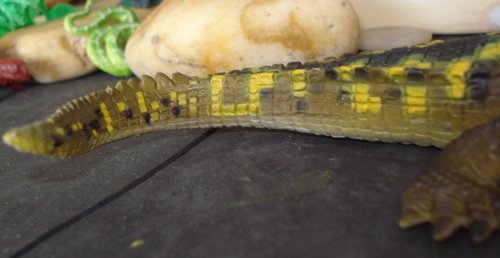 It is also remarkably resilient (see the June 11 Dinosaur Toys Blog "Deinoaccidentus" entry or the Blog Archive entry for that date). 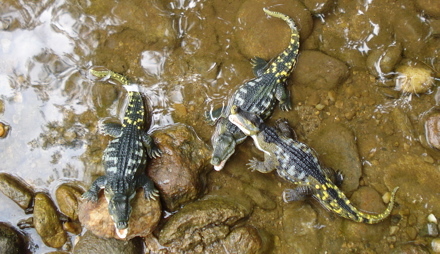 I have loved Alligators since I was very small. Since it remains in production it is readily available from Safari Ltd (opens new window) as well as other retailers on the internet including eBay for from $7.93 to $15.00, plus shipping where applicable, and of course brick & mortar toy stores across our great nation. Every product imported by Safari Ltd (the Carnegie Collection is made by Safari Ltd) goes through the nearly unlimited toxin-testing process mandated by our panicky congress and all pass with flying colors. You can cook these up or eat them as is with nothing more than a small saw and your own 32 teeth. Of course you'll still be hungry a half hour later. They also have the Euro-centric "CE" of safety, meaning you can have one with a light French cream sauce, if you wish. The paint is very durable, effectively requiring falling of a vehicle at 60 mph (see aforementioned blog entry) to rapidly damage it, and I have had two for over ten years with only minor wear (apart from the automotive skirmish). This is a highly recommended figure for any collection. The fact that it has been in production for a long as it has means that there are a lot of them out there. It is a collectible, certainly, a must-have, even, and a classic figure but I doubt that it will ever be worth much beyond its current value. Buy it because you like it, not as an investment. All bets are off if Carnegie comes out with a new one next year, but they told me they are not. 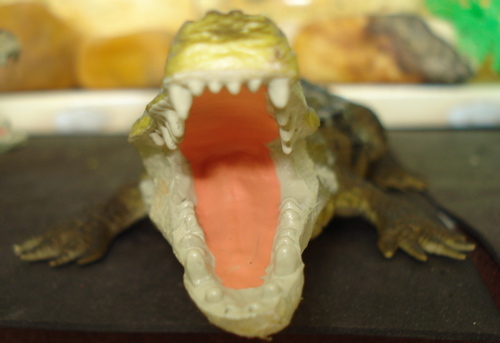 We hope that you have enjoyed reading about the Carnegie Deinosuchus Dinosaur toys. 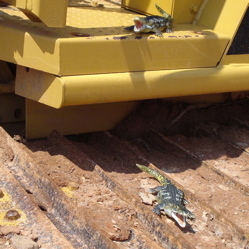 You can read about other carnivores by going to our big Theropods page by clicking this link. 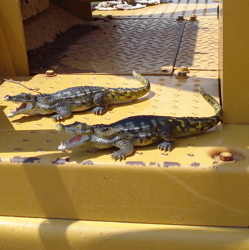 Our story left off with two Deinosuchus in search of a meal. "I dunno what we can do, Ralphie." "I got an idea Stuie. Let's visit a guy I know." "So that's our problem. Can you help us GoshFather?" "I got a score to settle myself with that Nigersaurus bum. Yeah, I can help"
"Ralphie! This is great. And BIG!" Now the only question is... is it too big? "Ya know, my feet don't reach the pedals. I can't make it go." "Neither can I, but it is perfect for sunning ourselves." And so our boys dream of better daze and easier hunts. "I hope those idiots didn't screw this up." Clearly Deinosuchus dream of the old days and an easy hunt. Have you been dreaming of your own, profitable website? You can make that dream come true, here.